Originally identified through spiritual and mystical art traditions such as the Tibetan Thangkas and Aboriginal Dreamtime Art, “Visionary Art” has re-emerged around the world as its own subculture and genre, and a new online Visionary Arts Academy is launching to support this movement. The modern genre of Visionary Art is best known through the works of Ernst Fuchs, Rudolf Hausner, Arik Brauer, and Alex Grey. It has often been referenced through the terms “Fantastic Realism” and “Interdimensional Art,” among others. 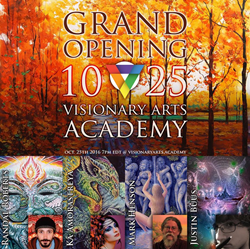 The Visionary Arts Academy was developed in partnership between Adam Apollo of Superluminal Systems, Josh Davis of Solpurpose (an online community of Visionary Artists), and Ka Amorastreya of the Visionary Arts Foundation (a non-profit that supports Visionary Artists). The Academy has a “choose your monthly donation” membership program that provides access to monthly live video interviews with artist leaders and academy faculty, as well as “LIVE Art” sessions where attendees can join leaders and other students to co-create together. Upcoming courses include an “Introduction to Perspective” with Mark Henson, “Sacred Geometry” with Ka Amorastreya, “Oil Painting Level 1” with Ryan Gatt, “Exploring Color and Tone” with Justin Buus, and many more. All the courses touch on the “Visionary” principles these artists embody in their works. “Visionary Artists generally agree on a few basic precepts: 1) Art has the power to create and shape our reality; 2) Art can reveal the unseen worlds of life-force energy, and all types of spirituality; and 3) Art can change our perceptions, and transform our psychological states of being,” states Adam Apollo. The Visionary Arts Academy includes many online resources to help students, faculty, and visitors connect with each other. These include live chat systems, member galleries, social profiles, discussion areas, and more. Students who complete courses earn Badges, which are compatible with Mozilla’s Open-Badge Backpacks for accreditation across Academies and organizations. A Grand Opening Live Session is scheduled for 7pm EDT on October 25th, 2016, featuring faculty artists Randall Roberts, Mark Henson, Justin Buus, and Ka Amorastreya, with hosts Josh Davis and Adam Apollo. Adam Apollo and Ka Amorastreya are also a featured in the "ReInhabiting the Village" book, co-created by an alliance of visionary partners contributing knowledge to foster thriving projects, organizations, and communities. Visit the Visionary Arts Academy website at https://visionaryarts.academy/. The Visionary Arts Academy is an online art education portal designed to give artists an opportunity to teach their craft to an eager network of students through online coursework. Courses cover a wide variety of subjects, from technique and process to personal transformation and self-development.